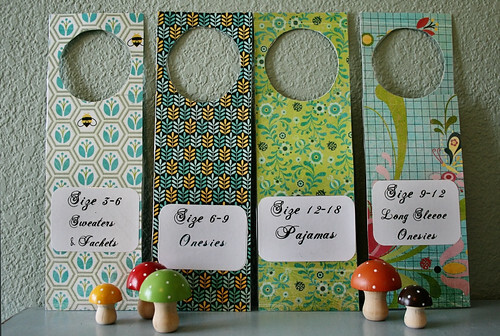 I received a lot of interest in my flickr series about the closet dividers I made for my daughter’s nursery so I thought I would post a little tutorial for those of you crazy enough (or pregnant enough) to attempt it. 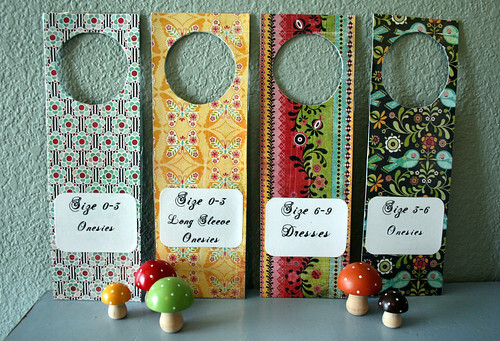 It has been suggested that I not post a tutorial for this and that instead I create these dividers to sell on Etsy. As fun as they were they were a whole lot of work and I’d feel compelled to charge hundreds of thousands of dollars in compensation so I think we’re all better off with a tutorial. For those of you who remember, I received more baby clothes for Isobel before she was born than my husband and I own put together. I’m talking massive amounts of ittty bitty pink onesies, dresses, overalls, footie pajamas, socks; you name it, I had four of them. Including infant bathrobes. Which, shockingly, I never used. I folded them all neatly and stacked them next to my supply of infant smoking jackets. My trepidation grew with my belly. How on earth was I going to keep track of all these clothes? All these sizes? All these hangers? 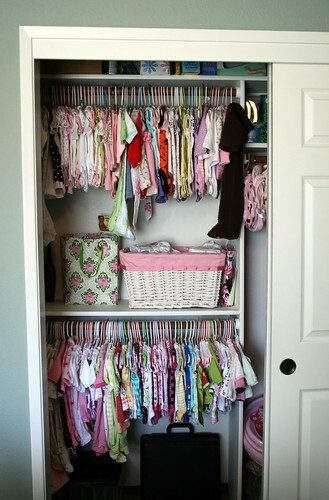 (Note to new moms: you will never have enough baby hangers. Stock up when you can.) I decided to put my nesting urge to work with my obsessive tenancy to organize and came up with the perfect solution: homemade closet dividers. These are a lot of work, a whole lot of work, and when I first began the endeavor I didn’t realize it would be as time consuming as it was. However, if you are pregnant and in the midst of nesting like I was, you will go to ridiculous lengths to complete this project. I’m sure there’s more than one way to do this but I’m going to post the way that I went about it. If any of you figure out an easier way to do this, please speak up in the comments. I’m sure there are crafters out there who would be eternally grateful. Paper – The most obvious thing you’ll need for this project is paper, gorgeous paper that you love, and the thicker the better. I went to the store in my town and found a notepad of large square crafting paper. It was gorgeous and I think I used all but one sheet. It was expensive, though. I’m not used to spending twenty bucks on paper. You’ll also need printer paper or some other paper to use as labels. Of course, you could also use printer-friendly labels found at an office supply store. Your choice. Cutting tools – By this I mean scissors but I also mean any other nifty tools that would help you cut out the circles from the middle of the hangers and any other tool to fancy up the paper. I used a hole-punch designed for making rounded edges on photographs for rounding the edges on my labels. I won it as a door prize for attending a scrap booking party one time, but I’m sure you could find them at the craft store. Adhesive – I used rubber cement for this but I’m sure Mod Podge would work if you want to decoupage them. I’m sure other sticky substances would work, too. Just remember that Elmer’s glue can make paper wrinkle. Experiment and find out what works for you. Door Hanger Template – I made this one in Photoshop and posted it on flickr. Enjoy, and feel free to make any adjustments you see fit! Laminator – You don’t have to laminate these, but it really helps them last. As I mentioned, you can always decoupage them. Lamination services are available at some office supply stores or at copy centers like Kinko’s. The first thing I did was figure out my closet organization layout to determine what labels I wanted to use. If I can figure out a way to post my labels so you don’t have to go through the headache of making them, I will. Because that was a lot of work and I sort of want to be your personal label-making savior. You do need to figure out how many labels you need to figure out how many dividers you’ll make. And then you’ll need two copies of each label because the dividers are double-sided. Print out the closet divider template on some very thick cardstock-ish paper. After it’s all printed and cut out and ready to go lay it on the wrong side of one of your fancy papers and trace with a pencil (oops, forgot to add that under materials – pencil!). I was able to fit three dividers on each piece of fancy paper. You are going to trace the template twice for each divider so count out how many you need and double that. Trace them and cut them all out. Once that’s done, you can begin the long process of gluing the dividers wrong-side together. Let them dry for awhile. I matched the dividers up so that they had the same paper on either side but now I’m not sure why I bothered. 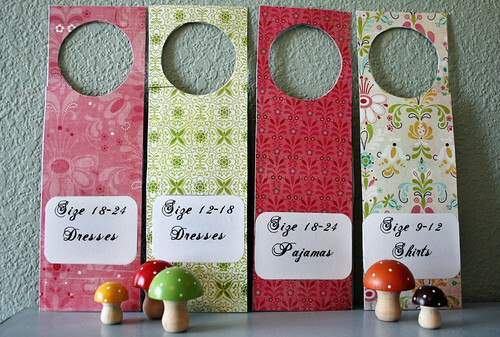 It would be just as cute, if not cuter, to have mismatched sides. No matter, cut ‘em out, glue ‘em together, let ‘em dry. Attach a label to each side of the divider. You can get as fancy or simple with this as you want. If I can figure out how to post the word doc labels I made I certainly will, but don’t limit yourself. If you have great penmanship you can write directly on the dividers themselves, or create your own lovely labels in Photoshop or Word. Avery makes those labels you just run right through the printer and that always works, too. Like I said I just printed mine out from word, cut them to side, and then fancied up the edges by using a photo-corner-roundening punch. After the labels are created and glued on and all dried you can decide whether or not you want to laminate them. If you do decide to go that route, leaving an edge of lamination around the dividers is a good idea. I did not and some of them started to come apart a bit. The big pain about laminating is that after all that cutting you then have to go back and cut them all up *yet again* before they are done. Honestly, however, if you’ve gone to all the work of making these you’re probably going to want them to last, so in my opinion it’s worth it. Plus, if you’re reading this there’s a good chance you’re a crazy pregnant lady hell-bent on nesting and nothing will prevent you from completing this task. That’s how it was for me. 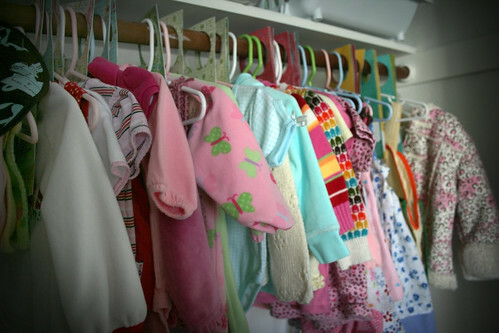 If you’ve followed these steps you now have your own gorgeous closet dividers perfect for you organizing the tons of baby clothes you’re obsessively organizing and then re-organizing at three in the morning. I’d love to hear from anyone out that who had the stamina to try this. Print out the labels on printer paper, nice paper, or on self-adhesive, printer-friendly labels. Print out the door hanger template on thick paper and cut out. Glue two fancy papers wrong-side together for each divider. Stick or glue label on each side of divider. Questions? Experiences? I’d love to hear all about it in the comments. You totally rock! Someday I’m going to win the lottery, fly you down to New Zealand, and let you organise my life while I get to play with Isobel. Um, I would love that. I would really love to see NZ one day and meeting you is on the list! P.S. I love organizing. I’m a dork. Super cute! I think I am going to take on this project. I have so much pretty paper because I was a scrapbooking freak at one point so I can just use what I have. I’m going to get started on this once I complete school at the end of this week…woohoo! By the way, I noticed a couple of clothing items we sent Isobel 🙂 Like that super cool sweater from Old Navy…has she been able to wear it yet? I know we bought it in size 18 months because it was the last one they had and we couldn’t not get it for her. That is our FAVORITE sweater, Alicia! She wears it all the time. We heart it. I’d love to hear how this turns out for you!